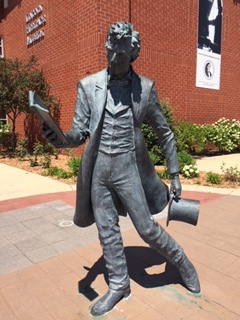 Abraham Lincoln traveled to DeWitt County twice a year between 1839 and 1859 to practice law on the 8th Judicial Circuit and to visit with friends. In fact, Lincoln visited Clinton, Illinois, over 100 times during his career. Abe’s most influential colleague in Clinton was Clifton Moore. Moore was an attorney who lived in Clinton and shared a love of reading with Lincoln. Moore owned an extensive book collection and often loaned Abe books to read on his journeys. Moore also supported Lincoln’s political career including organizing a Republican Barbecue with Abraham Lincoln as the main speaker. The national park passport cancellation stamp for the Lincoln Heritage Area is at the C.H. Moore Homestead/DeWitt County Museum. Although Lincoln never visited this particular house, it did once belong to the Moore family. The beautiful, two-story library with its unique, round, custom-made bookcases, as well as the extremely knowledgable docent, is worth taking time to visit the museum. Unfortunately little else is known about Lincoln’s court activities in Mount Pulaski because Logan County’s records were destroyed in a fire in 1857. 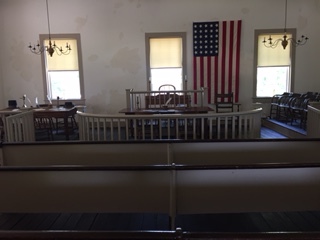 However, Abraham Lincoln did use his court time in Mount Pulaski to practice his public speaking skills and to develop friendships with political leaders in Logan County. Mount Pulaski is a quick stop for a look around and collecting the national park passport cancellation stamp for the Abraham Lincoln National Heritage Area. Lincoln, Illinois is the only town named Lincoln that was named for Lincoln before Lincoln became president of the United States. In fact, on August 27, 1853, Abraham Lincoln christened the city of Lincoln, Illinois with a watermelon and the words, “Nothing with the name of Lincoln has ever amounted to much”. Abraham Lincoln can also be found at the Lincoln Heritage Museum on the campus of Lincoln College in Lincoln, Illinois. The Lincoln Heritage Museum is a fabulous opportunity to learn about Abe by virtually experiencing his life. On April 15, 1865, Abraham and his wife Mary enjoy an evening out at Ford’s Theater to watch the play Our American Cousin. The date night ends tragically when John Wilkes Booth slips into the Lincoln box and shoots President Lincoln in the head. Lincoln lingered on the edge of death for about nine hours before the bullet proved fatal. The Lincoln Heritage Museum is a unique opportunity to walk with Lincoln as his life flashes before his eyes during these final hours. The tour begins in the box at Ford Theater. As I sit on a bench behind Lincoln and his wife Mary I can hear the play Our American Cousin. A shadow of a man with a gun appears and shoots President Lincoln in the head and jumps off the balcony. Lincoln slumps over. A door (a real door) opens and I’m directed by a voice to follow the light. (Yes, follow the light as Abe follows the light. Get it?) I follow lights and touch items that light up and listen as voices discuss current events (from the 1800s). It takes about an hour and 15 minutes to experience Lincoln’s life from his birth in Kentucky to his final breath in the White House. The experience is similar to walking through a haunted house; but it’s not at all spooky. It’s downright entertaining and educational and extremely well done. The Lincoln Heritage Museum is a unique opportunity to experience history like you are really there. Touring the museum is like living inside a book. Atlanta, Illinois is a small town in central Illinois. It has never been the county seat for Logan County. Therefore, Abraham Lincoln did not travel to Atlanta on his circuit riding law practice. So where is Abe, what is the Atlanta connection to Lincoln, and why is there an Abraham Lincoln National Heritage Area cancellation stamp at the Atlanta Public Library? Downtown Atlanta, Illinois is a very short block; not a square or a plaza or a cluster of businesses. After passing it twice, I found Abraham Lincoln on a wayside exhibit in tiny bitty downtown Atlanta. Apparently Atlanta was the first city in the state of Illinois to establish a group of Wide Awakes. Wide Awakes were a political group that gave a voice to young adults. Wide Awakes chose Lincoln as their candidate for president of the United States and campaigned for his election by orchestrating parades, organizing rallies, and encouraging men, especially young men, to vote. (Women did not have the right to vote until 1920.) The Wide Awakes are recognized for their efforts in assisting the newly formed Republican Party in becoming a viable political party. Although it is tenuous, there is a connection between Abraham Lincoln and Atlanta, Illinois. The Wide Awakes and their energetic, public campaign strategies were an important component to Lincoln being elected the 16th president of the United States. Abraham Lincoln did not travel to Carthage, Illinois often; however, in October of 1858 Lincoln delivered a rousing speech to a cheering crowd on the square in Carthage. Lincoln was campaigning for the 1858 senatorial election and although his efforts failed in the end, he worked hard at obtaining the support of Hancock county. When Abe visited Carthage, he would stay with his longtime friend, Alexander Sympson. 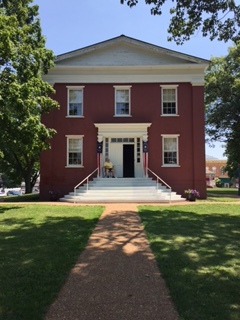 The doorway to the Sympson home, the very doorway that Abraham Lincoln passed through during his visits to Carthage, is on display at the Kibbe Hancock Heritage Museum. In fact, I walked through this very same doorway as I entered possibly the most intriguing, interesting, and unconventional small-town museum I have ever seen. Several of Carthage’s citizens are eccentric-historical-curator-types with a flair for creative drama. And they are fantastic. I wander through exhibits of taxidermied animals such as a bald eagle, a fox, owl, beaver, even a javelina; rooms set up like houses from several time periods; tools, pottery, arrowheads, drums, and moccasins; wedding dresses, every day dresses, party dresses, hats, gloves, and shoes; toys; pots, pans, and various kitchen utensils; guns, military uniforms, patches, helmets, and flags; fossils, rocks, and geodes; and countless odds and ends. I finally find Lincoln, dead, laying in state in a casket next to a replica of his tomb. What in the world? Did his funeral train pass through Carthage? Was his body displayed in Carthage? Why is Abraham Lincoln in a casket, in a museum, in Carthage, Illinois? I’m just “dying” to know so I weave and wind my way back to the front and ask the docent, “Why is there a dead Abraham Lincoln in a casket? Did the funeral train pass through Carthage? Was his body prepared for viewing in Carthage?” Her reply, “Oh heavens no. When the local funeral parlor closed down, it donated everything to the museum. We have a whole ton of caskets. 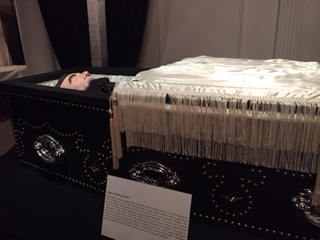 Go check out the funeral exhibit in the far, back corner.” I just love this place! I have to digress off the Lincoln subject for a paragraph. 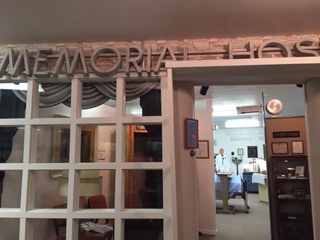 Following the funeral home’s example, when the local hospital shut down, it donated all its belongings to the Kibbe Museum. So what do these incredible people do? 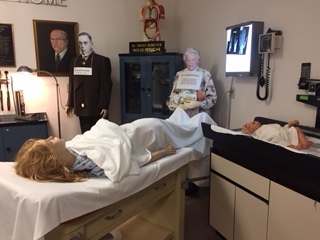 They set up a hospital exhibit. Included in the exhibit, which is absolutely amazing, are physicians who practiced medicine at Carthage Memorial Hospital. Life-size, three dimensional mannequins have flat, two dimensional photograph faces. I took photos, but really you just need to see it in real life. I’m “dying” (I just love this pun!) to return to Carthage, Illinois to see what these wonderfully creative, talented people come up with next! Nauvoo, Illinois was founded by Joseph Smith and his Mormon followers in 1839 after they were chased out of Missouri. The group arrived at a marshy, overgrown spot of land and decided to make a go of it on the banks of the Mississippi River. I arrive over 175 years later to find a charming, quaint village bustling with activity. It’s a summer weekend and the place is packed with Latter Day Saints campers, seekers, wedding guests, and me. The small unorganized state park is absolutely full and I can’t find an attendant or a camp host anywhere. After driving the loop three times, dragging my faithful little teardrop behind me, I head to the visitor center. The friendly tour guides direct me to Peter’s Place, an RV park just on the other side of the village. After settling into my new digs at Peter’s Place, I go looking for Lincoln. I cannot find Abe anywhere. He is not downtown, he is not in Nauvoo State Park, and he is not at Peter’s Place. Where in the heck is Abraham Lincoln and what is his connection to Joseph Smith? I go back to the visitor center at the Joseph Smith Historic Site, stamp my national park passport with the Abraham Lincoln National Heritage Trail cancellation stamp, pay for a tour, and join the group of Mormons on a Joseph Smith pilgrimage. I am the only tourist on a quest to find Abe. Everyone else is looking for Smith who is apparently buried here. It turns out that Abraham Lincoln never, ever went to Nauvoo. The only connection Lincoln has with Joseph Smith is that Abraham Lincoln was an Illinois legislator when Nauvoo’s city charter was approved. Hmmm. Well at least I discovered why I couldn’t find Ole Abe. And I got a cancellation stamp! Quincy, Illinois is a pleasant town located on the mighty Mississippi River and it was the site of the sixth Lincoln-Douglas debate. In 1858, Illinois was a “free” state and Missouri, directly across the Mississippi from Quincy, was a “slave” state. On October 13, 1858, thousands of spectators came to listen as Abraham Lincoln and Stephen Douglas argued mostly about the slavery issue. Located on the corner of the square where the debate was held, the History Museum showcases a presidential papers collection focusing on Abraham Lincoln. One fascinating exhibit is a set of political cartoons from the presidential election of 1860. I enjoyed the artwork as much as the satire. I also grabbed up a national park passport cancellation stamp as well as a “bonus” stamp. In 1822, John Wood became the first settler in Quincy, Illinois when he purchased land that was part of a military settlement. He originally named the town “Bluffs”; however, it was renamed Quincy in 1825 after President John Quincy Adams. Wood was mayor of Quincy three times before becoming governor of the state of Illinois in 1860. While he was governor, he was allowed to govern from his home in Quincy leaving the Governors Mansion in Springfield vacant. Wood and Abraham Lincoln were political allies and friends. They were both against slavery and worked together to help form the Republican party. When Lincoln was chosen as the Republican candidate for president of the United States, Wood allowed him to use the Governors Mansion in Springfield as a campaign office. Currently, the John Wood Mansion in Quincy is available for guided tours.